#9 in the nwsportsjunkies.com ’12 Days of the 12th Man Countdown’ brings you some info on 2 of the most beloved Seahawks. They make us laugh… they make us cheer… the get us pumped up, the team mascot. Mascotte is French for Talisman or Charm. In 1880 French composer Edmond Audourian’s wildly popular French operetta was translated to English, as The Mascot, introducing the word to the English language as any animal, person, or thing which brings good luck. While some Mascots are chosen seemingly at random, a lot of thought is put into other mascots to symbolize a local tradition, or trait. The Seattle Seahawks our fortunate enough to have 2 Mascots, Blitz and Taima. Blitz is a large blue, body building, hawk, decked out in Seahawks Jersey and game pants. Blitz made his debut Opening day 1998 back in the Kingdome. In addition to his contributions on game day, Blitz serves as a team ambassador for charitable and community events as well as numerous kids programs. Did you know… Blitz’s alter ego, Ryan Asdourian, is a 32-year-old Microsoft employee in Redmond. It’s no surprise that even without the large beak and blue feathers, Ryan is known as the ‘Go-to guy,’ for product demos, presentations and corporate events. I’m guessing he does not have a fear of being in front of large groups of people. 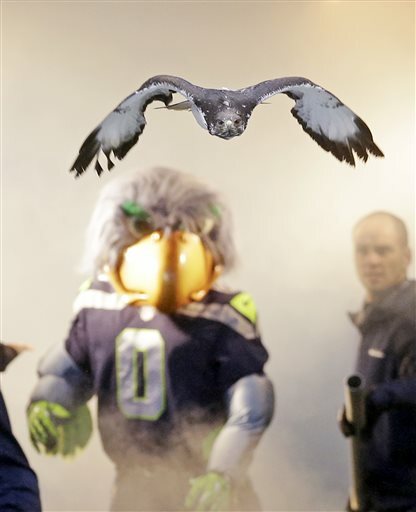 As previously mentioned, the Seahawks have a second Mascot, Taima. Unlike his costumed partner Blitz, Taima is an actual bird. Taima, which means “Thunder,” in the local native american language, is a Blue Augur Hawk born at the World Bird Sanctuary in St. Louis, Missouri in 2005. 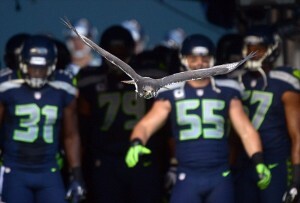 Taima and his a 4.5 foot wingspan, soar out of the home team tunnel and swoops across the field to lead the charge as the Seahawks take the field. Taima has been the 1st Seahawk out of the tunnel since he arrived in 2007, and it is said that ‘The game don’t start until Taima the Hawk says so.’ Make sure to check back in tomorrow for the next part of the nwsportsjunkies 12 Days of the 12th Man countdown!